Sister Cecilia (née Arliss) Carey, O.P., was born August 17, 1921 in Casselton, North Dakota and died August 12, 2016 at the Sinsinawa Motherhouse. She attended St. James Grade School in Wausau, Wisconsin. She then came to St. Clara Academy, Sinsinawa, as an aspirant where she graduated in 1938. She was received August 4, 1939. She made her first profession as Cecilia on August 6 1940, and her final profession three years later on August 6, 1943. Sister Cecilia studied at Rosary College and Illinois University receiving her bachelor’s degree in Education at Edgewood College in 1946. She earned a Master’s degree in 1952 and a Ph.D. in English Literature from the University of Wisconsin Madison in 1959. The title of her dissertation is The Poetry of Marianne Moore: a study of her verse, its sources, and its influence. She taught at the following schools: St. Luke, River Forest, IL; St. Rose, Milwaukee, WI; St. Cecilia, Omaha, NE; and Freeport Aquin, Freeport, IL. At Edgewood College she taught English literature. 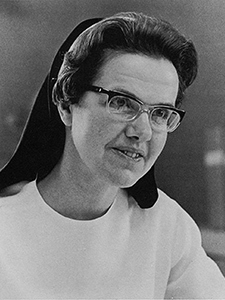 Sister Cecilia was the Edgewood College’s seventh president, presiding from 1967-1977. From 1977-1986, she was Prioress of the Sinsinawa Dominican Congregation. From 1986-1989, Cecelia taught at a school in Cochabamba, Bolivia and at Rosary College in River Forest, IL. She served as a pastoral associate at St. Mary Cathedral, Ogdensburg, NY, and St. John in the Wilderness Parish, Lake Clear, NY.